In times of pain, sickness, or stress, my first thought of “remedy” is quiet meditation with the most sacred Medicine Buddha mantra. Inevitably, arthritis pains subsides in my case, and I’ve avoided most of the colds and flus that go around my business meetings— knock on wood. I give Medicine Buddha, exercise and good nutrition the credit. Chronic, advanced arthritis is mostly kept in check with Medicine Buddha practice — and some occasional check-ins with the doctor. Nor am I alone. Tibetan doctors rely on Medicine Buddha for their healings. Regular practice with the Medicine Buddha also empowers one to heal others. In China and Japan, Medicine Buddha is a refuge in times of illness. Around the world, literally millions call out the name or mantra of Bhaisajyaguru (भैषज्यगुरु). It is even written in the sutras that if you speak the name of the Medicine Buddha in the ears of a dying animal or human they will be ensured good rebirth regardless of their past karma. No wonder the Medicine Buddha is so popular. 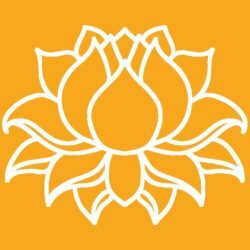 Namo bhagavate bhaisajyaguru-vaidurya prabha-rajaya tathagataya arhate samyak- sambuddhaya tadyatha. Om bhaisajye bhaisajye bhaisajya-samudgate svaha! This can be translated as: “I honour the Lord Master of Healing, the King of Lapis Lazuli Radiance, Tathagata, Arhat, Perfect Enlightened One, saying: To the healing, to the healing, to the supreme healing hail!” The last line of the Dharani is, of course, the short mantra. Visualizing the Medicine Buddha Mantra and rays of healing Lapis Lazuli light emanating from the Buddha, and absorbed into the patient (or self) assists in healing. Surrounding the Buddha is the Medicine Buddha Mantra in Tibetan script. In advanced practice this is also visualized. Om Ah Hung in Tibetan script. We visualize these glowing syllables radiating from the crown (Om), Throat (Ah), and Heart (Hum) in white, red and blue. Om Ah Hum in Sanskrit script. 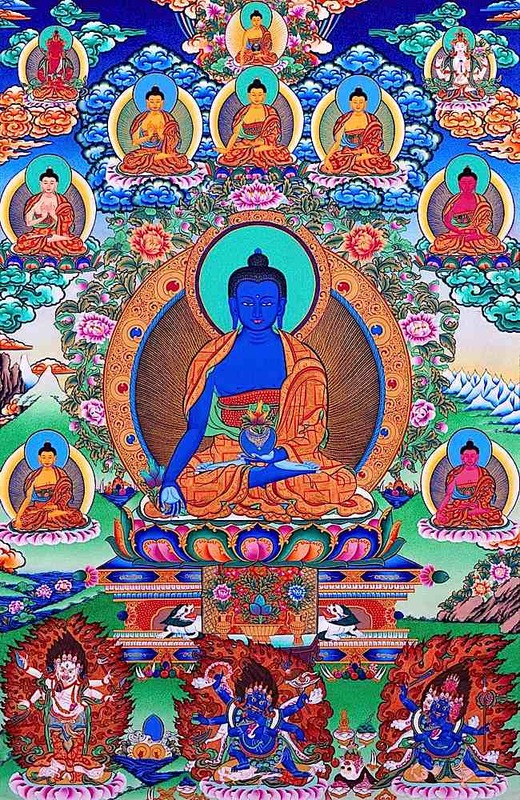 In my tradition we visualize the seven Medicine Buddhas (see the top tangkha), but the simplest visualization is to envision a shining Lapis Lazuli blue Buddha, beautiful in radiance, perfect in all His features, in a monk’s robe in full lotus on the Lotus and moon throne. His face is serene and compassionate, and he has the features of a great Buddha. In his left hand is the Lapis-colored jar of medicine nectar, a medicine that not only cures all ills, but also negative karma, tensions, suffering, poverty and any other sufferings. In his right hand is the stem of the Myrobalan, with Aruna fruit, held between thumb and forefinger. He is surrounded by a glowing nimbus and aura of Lazuli-colored light and as you chant, his crown, throat and heart glow with powerful seed syllables: Om (crown chakra) Ah (throat chakra) and Hum (heart chakra). My teacher normally encourages us to visualize with Tibetan script as it is very beautiful. (See Tibetan Script Visualization to the right). You can visualize in Sanskrit characters (left). Or even Roman alphabet if that is difficult: Om Ah Hum. Then, healing light radiates from the Medicine Buddha’s heart, penetrating either your crown or heart, filling you with healing light, and driving out bad karma and sickness as visible black sludge and smoke. Some experienced visualizers envision white light from the Buddha’s glowing Om flowing into their own crown; and red healing light from the Buddha’s red Ah syllable flowing into their own throat; and blue healing light from the Buddha’s blue Hum flowing into their own heart chakra. Often He is visualized with his two attendants Suryaprabha and Candraprabha, who are the sun and moon Bodhisattvas. In Soto and other Mahayana practices, you might also visualize the Twelve Warriors of Bhaisajyaguru, who relate directly to the twelve great vows of the Medicine Buddha (see below.) In my practice, we visualize the Seven Medicine Gurus plus Shakyamuni as the Eighth Medicine Buddha. In China and Japan, Bhaisajyaguru is part of the most important trinity of Buddhas, here shown in traditional form with Shakyamuni in the centre, Medicine Buddha on the right (of Shakyamuni, left to the viewer) and Amitabha Buddha on the opposite side. 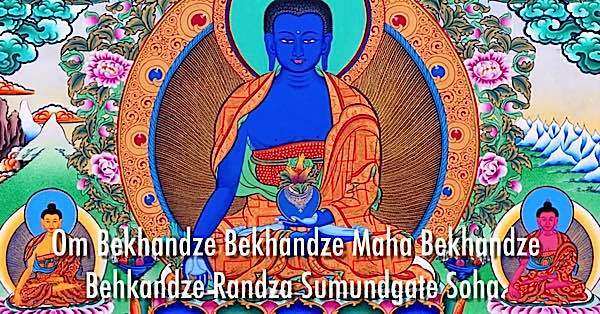 Aside from visualizing and mantra recitation, a common healing practice is to chant 108 of Medicine Buddha’s mantras over a glass of water. The chanter, preferably one who has chanted the mantra in regular practice, then blows on the water and offers it to a sick person. The empowered water has healing powers. The patient can also be requested to speak the name of the Buddha 108 times, or chant the mantra, or read the sutras, or just to gaze up on a loving picture of the Medicine Buddha. Many miraculous cures have been attributed to the Medicine Buddha. From my own experience, when two tylenol do not work, the mantra certainly does. Tibetan doctors tend to begin each day with Medicine Buddha practice, and when making herbal medicines chant the Mantras while working to further empower their medicinal benefits. 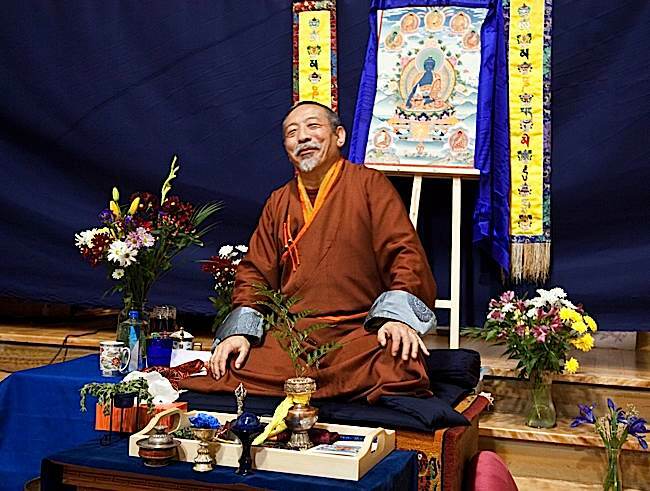 His Eminence Zasep Tulku Rinpoche giving teachings on Medicine Guru to a large audience. He returns to Toronto Sunday November 13, 2016 at 3pm to give Medicine Buddha initiations. Information at Gaden Choling, or the end of this feature. 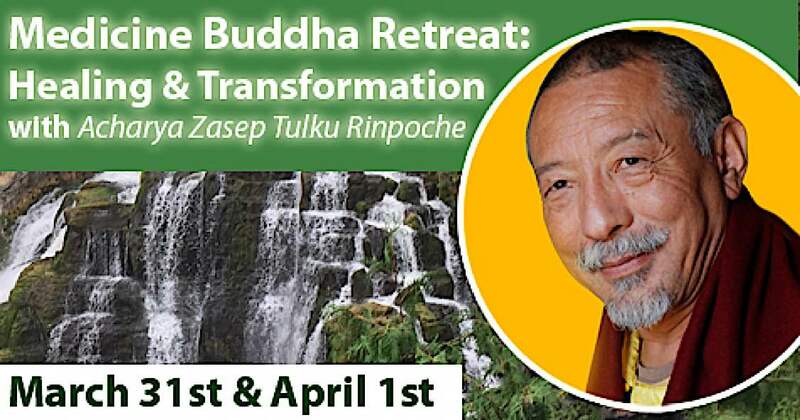 Faith plays a role in healing, in that having absolute faith empowers practice, yet I have seen from past experience, as have many others, that chanting the Medicine Buddha Dharani or mantra for non-Buddhists — who might have no faith —is equally effective. The power is not all about faith. 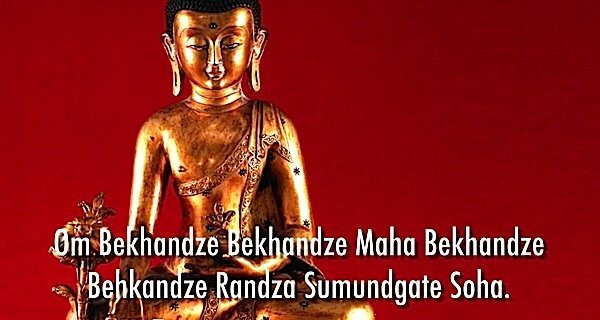 In the sutras, Shakyamuni Buddha, the living Buddha of our age, taught the Dharani of the Medicine Buddha to benefit all beings, from gods to hell beings. The Eight Medicine Buddhas. In the centre is Bhaisajyaguru Vaduraprabha, the Lapis Lazuli Medicine Guru, surrounded by the other healing Buddhas. Shakyamuni is the eighth Medicine Buddha. 2. I vow that my body be like crystal, pure and flawless, radiating rays of splendid light to every corner, brightening up and enlightening all beings with wisdom. With the blessings of compassion, may all beings strengthen their spiritual power and physical energy, so that they could fulfil their dreams in the right track. Who couldn’t feel drawn to a Buddha willing to help us with such powerful vows, simply by virtue of calling his name? 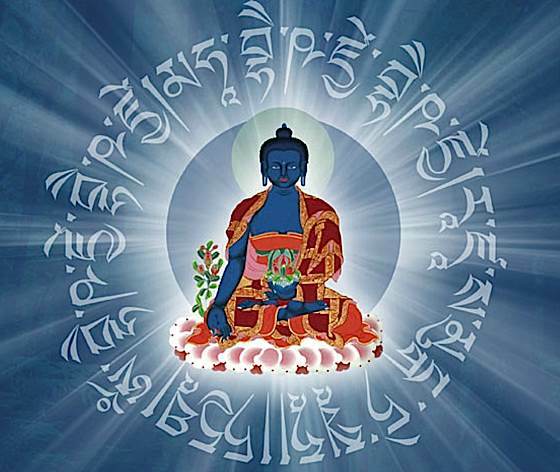 Medicine Buddha’s mantra in Tibetan Script. 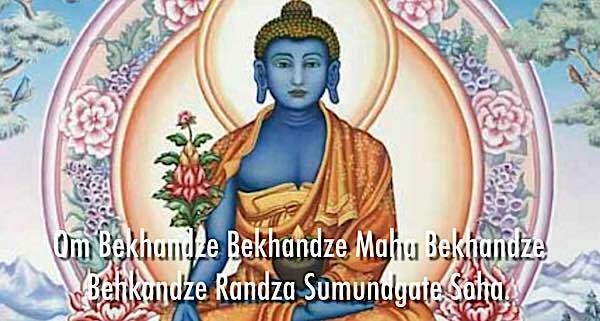 Transliterated, it is pronounced: Tayata Om Bhekandze Bhekandze Maha Bhekandze Raja Samudgate Soha. 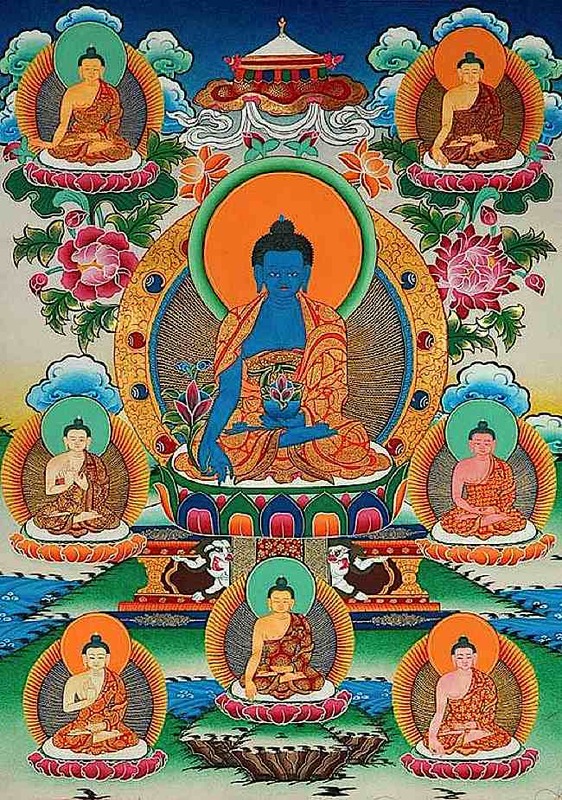 There are several “Medicine Buddhas”—seven, plus Shakyamuni Himself as the eighth, each separately honoured and named, but where one Medicine Buddha is practiced as a solitary meditation, normally this is Bhaisajyaguru Vaiduryaprabharaja (भैषज्यगुरुवैडूर्यप्रभाराज)—the Medicine Guru of Lapis Lazuli Light. His pure land is in the east, and is called Vaiduryanirbhasa, or pure Lapis Lazuli Land. He might also be known as Sanye Menla (Tibetan སངས་རྒྱས་སྨན་བླ།, or just Menla), Medicine King, Medicine Guru, Yaoshifo (藥師佛 Chinese name), Nyorai or Yakushi (in Japan 薬師, 薬師如来), Yaksabul or Yaksayeorae (약사불, 약사여래 in Korea)or Lapis Luzuli Buddha. In many practices, seven or eight Medicine Gurus are honoured. The eighth is Shakyamuni Buddha, the historical Buddha of our era—who taught us the Dharma. When chanting the praises, I prefer the poetic Enlish names to the Sankrit, just because of the beautiful descriptions. In a full practice session or a puja, each of the Buddhas would receive His own praise. As you visualize each of the Buddhas you prostrate and make envisioned offerings. wonderful article, really helpful, informative and eloquently written. Thank you also for your own personal comments/story. I’m studying to become an alternative medicine healer and have just received a beautiful statue of the medicine buddha that l intend to honour every day. Your article and insight have just helped make this a reality, thank you. Thank you. Very beautiful and well spoken. What a beautiful article ! It will be of great help to many others. I am indeed very very grateful for all this information which is very hard to find – particularly the way the explanations are given. I like the last comment which says that it is not by coincidence that we have come to this article. Please send blessings. Thank you very much. As I read out ‘Lapis Lazuli’ the first time tears suddenly filled my eyes, was sobbing uncontrollably for a minute. 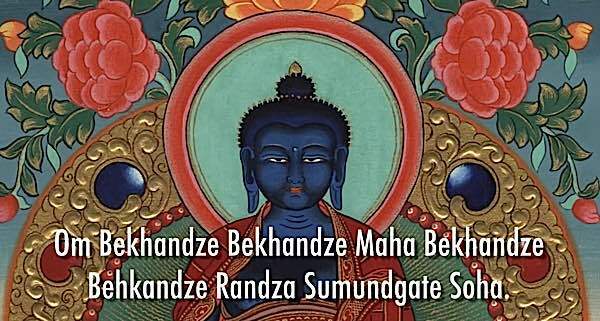 Please do tell if this was the Medicine Buddha’s original Sanskrit name? Thanks for every thing you are teaching us. Request to know in detail the seating arrangement in your picture. Medicine Guru being in the center, please let us know so we could visualize them. Hi Lee, I’ll be happy to try to help out. Which of the two Thangkha images are you referring to? The Medicine Buddhas are in different positions in each. 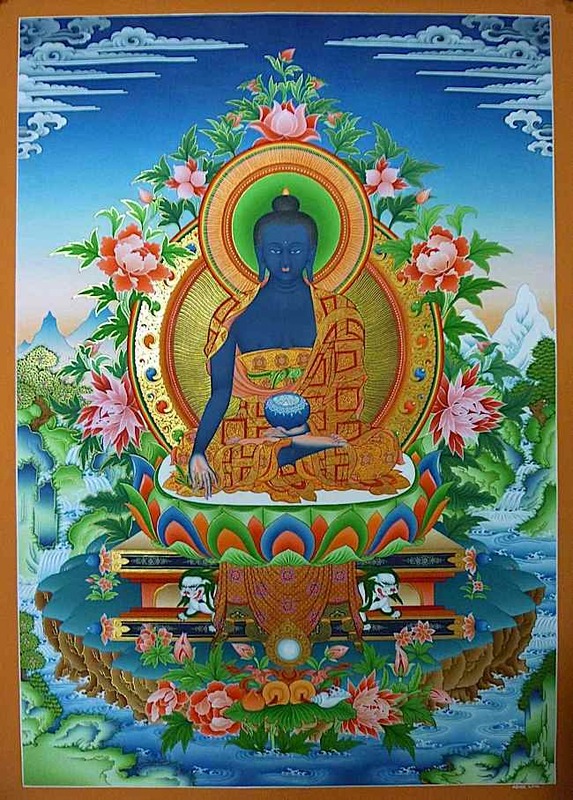 Basically, you always visualize the Lapis Lazuli Medicine Buddha as either central (if front visualized—in other words facing you, so that you can make offerings) or on top of your head (if you are initiated by a teacher for this practice… it would be best to ask your teacher, in this case for the proper visualization, as each tradition is slightly different). No visualization is wrong, but your teacher is always right:-) In other words, if you have a guru, I’d ask. If you are trying to identify the eight Buddhas by name, then the COLOUR and mudra are the clues. With frontal visualization (requires no initiation, generally), you can visualize either as you see in these thangkhas, or as a pillar, with Bhaishajyaguru largest and on the bottom. Or, you can really simplify, and have a most effective practice by just visualizing Bhaishajyaguru alone. Suparikirti-tanamasriraja: Tathagatha Glorious Renown of Excellent Signs on top of Svaragosaraja and golden. 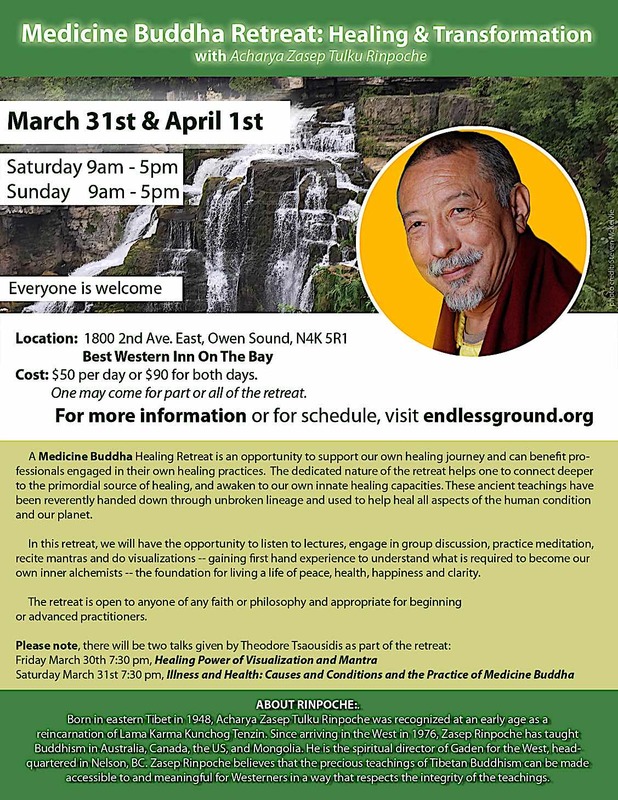 I am re-motivated to start up my Medicine Buddha practice. I had forgotten the beauty and even with the slightly longer puja then many, it is a very joyful and happy practice. Thank you for your writing and many wonderful new images. Is there a connect from the sutras with Dhanvantari from the vedas? Hi Paul, not that I know of — but bear in mind I know very little about Dhanvantari. As I understand, Dhanvantari is the healer of the gods, an avatar of Krishna (I believe, I’m not an expert on this). Bhaishajyaguru is not a god, but rather an Enlightened Buddha. He’s not an avatar. 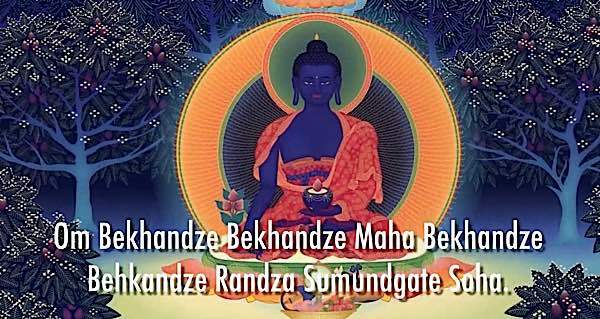 The key difference is there’s no sense of worship or supplication with Medicine Buddha. You are meditating on this aspect of the Buddha you yourself have within (your own innate Buddha Nature), and you yourself are healing yourself. Thanks for your great question. 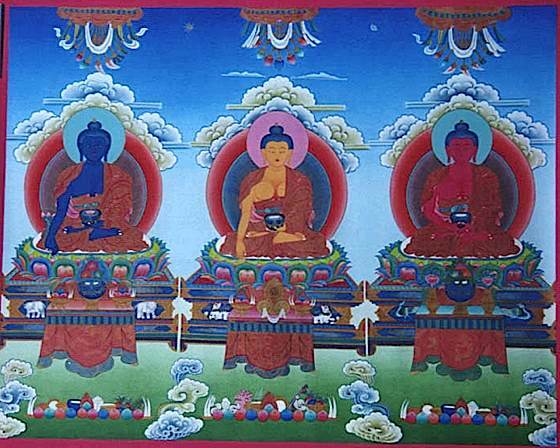 They share few common elements in the traditional iconography of thangka paintings. 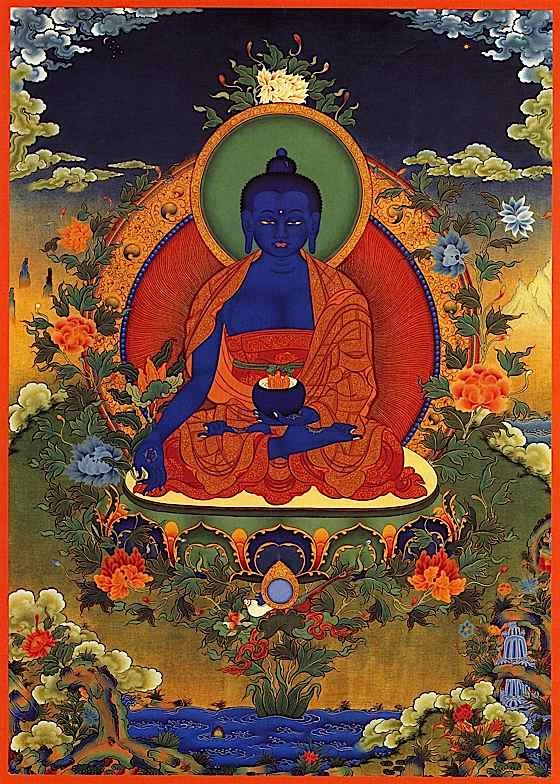 Dhanvantari is directly associated with the Ayurveda while Medicine Buddha is represented in the first page of the Blue Beryl, the book of the Tibetan Medicine. I guess should be Suvarna-bhadra-vimala, not Suvarna-bhadradra-vimala. – perhaps bhadra might mean just ´good´ while ´bhadradra´ exellent. Hi, I’d been searching for the “Sutra of the Vows of the Medicine Buddha of Lapis Lazuli Crystal Radiance and Seven Past Buddhas” in English but could only find the Chinese translation. Do you happen to have one or can you help point me to the right direction please? Thank-you!